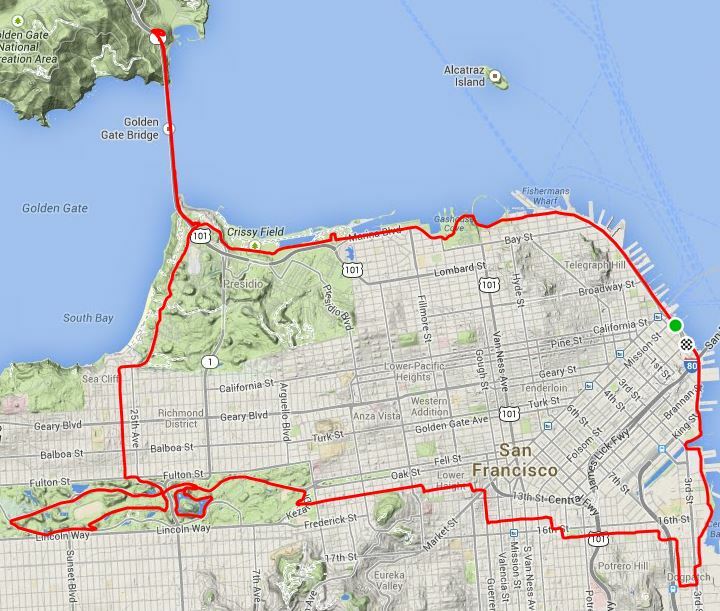 On July 27th, I ran The San Francisco Marathon. Yep, another late run report post – bad blogger! Weather. The weather was on the warmer side for San Francisco, 63 degrees at the start and I’m positive that it warmed up to at least the mid 70s over the course of the day. It was overcast at the start and bright and sunny when I finished. No real wind on the Golden Gate, which was nice. Heading up to the Golden Gate, it sprinkled a bit, but that was shortlived and mainly because of the fog and low clouds blowing through. All in all, an excellent weather day for running. Management/Support. Course management and support was great, by my observation. I carried my handheld, so I only made use of the aid stations at miles 10 and 18 to refill and restock my Tailwind Nutrition mix. I’ve heard that there were issues with water shortages at a few of the aid stations later in the race. As for course marshaling and management, this was excellent! Volunteers were abundant and the SFPD and Biker crews made sure all runners were safe and supported. Another benefit this year was free race photos – such a cool thing…thanks SFM! Grand total: 20,055 motivated runners! Post-Race. The post race area was average for any event – good flow for the finish and the usual food and SWAG booths. Because the shut down the Embarcadero, there are plenty of places to hang out and recover, which is always great. Medal/Shirt. Each marathon finisher received a coaster medal, which is specific to the 26.2 (the other distances are unique to that particular distance…and smaller.) As for the event shirt, the WESR (Wife’s Event Shirt Rating) is a 3.5/5. The color was basic, but the logo on the back was great this year, so it raised the rating. I didn’t like the official race apparel that they offered this year. IMHO, it was boring. The shirts were all basic colors and only text this year – I miss the cool shirts over the past few years: course map t-shirt from 2012, orange sunburst t-shirt from 2013. Needless to say, I left without any t-shirt souvenir. 😦 Bring back the cool shirts SFM!!! This was my fifth marathon and I had PR hopes coming out of my training. Bottom line: I certainly WAS NOT going to NOT run. Mainly out of stubbornness and also because this year was the final leg in my 52 Club challenge and I wanted to earn that sweatshirt. Follow my pacing plan – which factored in all hills and aid station stops. Have fun – which is a given! Amidst the throngs of people, I was able to meet up with a friend at the start and run with her. This was Ruth Ann’s first SFM, so it was great to be able to run with her – especially since she was shooting for a sub-four finish. In the end, she made her sub-four…huge congrats to her! If I said that my foot was pain free at the start, I’d be lying. It was “there”, but not enough to abandon my goals. So, at the horn I went for it! So, I crossed the line with a 4:07:43 finish time – again, my slowest to date – but knowing that I earned my 52 Club sweatshirt, still with a decent time, and positioned to heal and run well another day. Fueling. I did my usual, pre-race, carb loading/regimen: 36 hours of >80% carbs and +1000 calories above my normal day. Race-day fueling: Bagel with 2T peanut butter at -3 hours. During the race, I drank about 45 ounces of Tailwind Nutrition’s Mandarin Orange mix. Equipment/Kit [head to toe]: Buff, tech shirt from the 2012 Big Sur Half Marathon (I seem to wear this for races alot! ), Armpocket armband, Amphipod handheld, Garmin 910XT, Road ID (Slim), Mio Link heart rate band, Brooks Essential 3.5″ Split Short, CEP Compression Sleeves, Injinji Run 2.0 socks, Altra The One(2) shoes. Bottom line: Good day by any standard, even though I didn’t make my 3:55 goal. Earned my 52 Club status! Post-race meal: Red Lobster 4-Course Feast – soup, salad, talapia, and a triple-Chocolate Brownie à la Mode!